If you were a pre-teen or teen in the early 200’s, then you definately remember Avril Lavigne. When her debut album was released in 2002, it shot to the top of the Billboard Hot 100 charts, and its single “Complicated” went number 1 around the world. It became an anthem to a generation love stricken teenagers whose angst was at an all time high. Lavigne was dubbed the “pop punk princess”, and while she may not be as famous as she once was, her single “Complicated” and the music video it was accompanied by is worth looking at. The early 2000’s in one picture. The music video starts with Lavigne and her friends (her backing band) invading a local shopping mall. They spend the day causing mayhem and having a good time, riding toy cars and scaring shoppers at the clothing store. The video cuts back and forth between the band at the mall, and them performing at a skate park, reinforcing Lavigne’s skater punk image. The song itself has an incredibly catchy hook and features Lavigne’s light yet somewhat raspy voice that allowed her to really stand out in pop and punk music. Compared to most other punk rock music, the song is relatively slow and is more ballad-like in that regard, which is fitting considering the lyrics are about a complicated relationship. Nothing says punk like a pair of chucks! 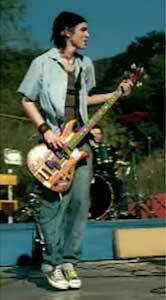 Avril Lavigne has been known to wear chucks often during this time period, but she does not wear a pair in this video. However, her guitarist does don a pair of gray Chuck Taylors and can be seen showing them off as the band plays at the skate park, and as they roam around the mall. Chucks can also be seen on the feet of various skaters at the skate park. This song and it’s music video are a moment in time. They may seem a bit out of date now, but they do have their place in music history and at one time did make a girl from Belleville, Ontario, Canada the biggest pop star in the world. Confronting the cops in chucks.